Miami just keeps finding different ways to win. The No. 3 Hurricanes were down by as many as 14 points two separate times, which is the largest deficit they had faced all season. But both times, they came roaring back in typical UM fashion: with the Turnover Chain and a few big plays by starting quarterback Malik Rosier. Miami overcame an exceptional performance by Virginia quarterback Kurt Benkert to defeat the Cavaliers 44-28 and remain undefeated in a back-and-forth matchup Saturday afternoon at Hard Rock Stadium. Miami (10-0, 7-0 ACC) scored 30 unanswered points to close the contest. The UM offense was anything but consistent against Virginia (6-5, 3-4 ACC), specifically in the first half. But the Canes kept grinding like they had been doing all year, fighting until they got the breakthrough. Rosier threw for 210 yards, three touchdowns and two interceptions. He added 38 rushing yards on nine carries and the eight-yard touchdown run in the red zone that gave Miami its first convincing lead with four minutes remaining in the final quarter. 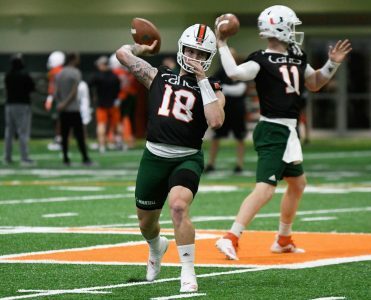 Benkert, who finished with 384 yards passing and four touchdowns, was absolutely on fire, completing his first 12 passes and throwing just one incompletion going into the second half. But his first mistake became one that Virginia could not recover from. 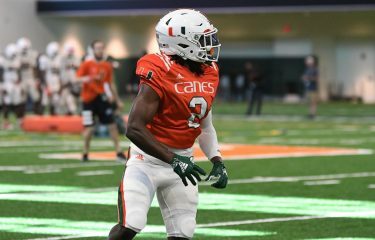 After the Hurricanes scored to make it 28-21 with the Cavaliers up, Benkert threw an interception right into the hands of UM safety Jaquan Johnson who returned the ball all the way back for the touchdown to tie the game with 9:57 left in the third quarter. Virginia’s offense never looked the same from that point. Canes sophomore running back Travis Homer had just five yards rushing on six carries at halftime. He finished with 96 yards rushing on 17 carries and the touchdown that put the game away with 1:16 left. He also completed the 36-yard rush that set up the Rosier touchdown-run late in the fourth quarter. The Miami defense played arguably its worst 30 minutes of coverage football in the first half, but in the second half, it forced Benkert to make a few bad decisions and racked up three huge sacks in the final possessions to eliminate any hope on Virginia’s side. Johnson, who won ACC Defensive Back of the Week after the win against Notre Dame, continued his strong play against the Cavaliers. He led the team in tackles for the fourth-straight game with nine, while adding a pick-six, a sack and a tackle for loss. Defensive tackle RJ McIntosh tallied three tackles for loss and senior defensive end Trent Harris recorded two sacks. UM’s defense racked up 11 tackles for loss, five sacks and forced three turnovers on the afternoon. Miami will travel to play its final game of the regular season against Pittsburgh at noon Nov. 24 at Heinz Field.